Feast your eyes on Jupiter! 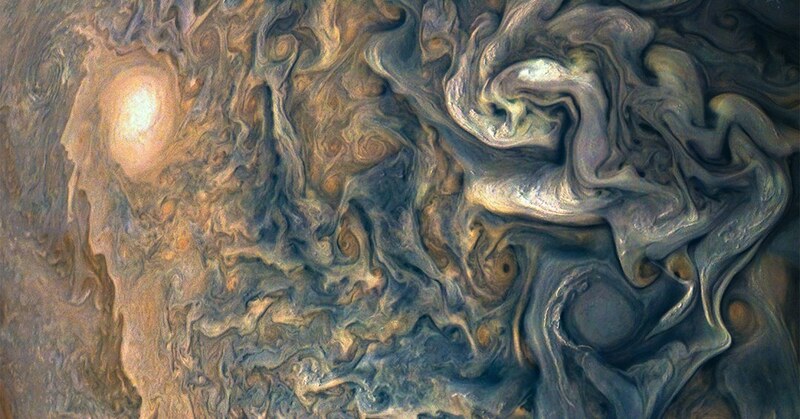 This photo was taken by the Juno spacecraft currently in orbit around the gas giant, just a few weeks ago on December 16. Here, the dizzying whorls in Jupiter’s clouds are seen in unprecedented detail, as high-flying storms cast shadows onto the atmosphere below. They don’t call it the king of the planets for nothing; the scale in this image is 5.8 miles per pixel. Scientists around the world are gearing up for the launch of the James Webb Space Telescope, Hubble’s bigger, badder successor. By using the powerful infrared instruments on the JWST, astronomers are hoping to unlock the mystery of how odd space objects form—like the brown dwarf stars in this star cluster, called NGC 133. These “failed stars” are scattered around the universe and have been intriguing astronomers since they were first discovered in 1995. Brown dwarfs are the missing puzzle piece between red dwarf stars (our sun’s ultimate fate) and gas giants like Jupiter. They begin to form like normal stars but stop before hydrogen fusion begins, a crucial step for star formation. This is a real photo. I repeat, this is in fact a real photo of the gorgeous barred spiral galaxy NGC 1398, taken by the European Southern Observatory’s Very Large Telescope in Chile. Unlike the more traditional spiral galaxies, barred spirals like NGC 1398 have sweeping arms outside their main section, connected only by a straight band of stars (a bit hard to see in this image). Spiral galaxies like our own swirl outward from the galactic core, but barred spiral galaxies like this contain a tightly bound arm. Other galaxies like NGC 1398 have been discovered with this shape, but astronomers are still unsure how they form. While Juno was swinging past Jupiter on December 16, asteroid 3200 Phaethon was making its closest approach to Earth, coming as close as 6.4 million miles away. Astronomers at the Arecibo Observatory in Puerto Rico captured the asteroid in the series of images seen here. Astronomers discover around 30 new near Earth asteroids every week, adding to the total 15,000 currently catalogued. Arecibo tracks them regularly because, well, no one wants to actually live out Armageddon. This beautiful red and blue glow is a planetary nebula surrounding a dying star. When smaller stars like our own die, they don’t get a hero’s death, exploding into a supernova. Instead, they transform into what’s called a red dwarf star. Then, when its life as a red dwarf is over, it begins shedding material and spewing gas out into space—star stuff that eventually forms into planets. This galaxy, called Kiso 5639, is seen here in an edge-on view, looking like a cosmic cigar of sorts. This odd galaxy is illuminated on one side with bright pink hues, created by hydrogen—the fuel of baby stars. This hot glowing area is an extremely active area of star formation, equal in mass to around 1 million of our suns. And it’s young! This region only formed around a million years ago.